Rochefort | Beer Apprentice - Craft Beer News, Reviews, Interviews and Info. Hello again guys. For today’s craft beer review I have a very special brew to try. It’s the Trappistes Rochefort 10 produced by Brasserie de Rochefort (Abbaye de Notre-Dame de Saint-Remy) located in Rochefort, Belgium. I have previously had (and reviewed) both the 6 and the 8, but the 10 is supposed to be the cream of the crop, so I can’t wait to get this in a glass and see if it lives up to the hype. I’m going to have to revert to ratebeer.com to find any kind of description on this beer because the website, http://www.abbaye-rochefort.be/, is written in French and Dutch. This brew comes in an 11.2 oz. bottle and it has an ABV of 11.3%. 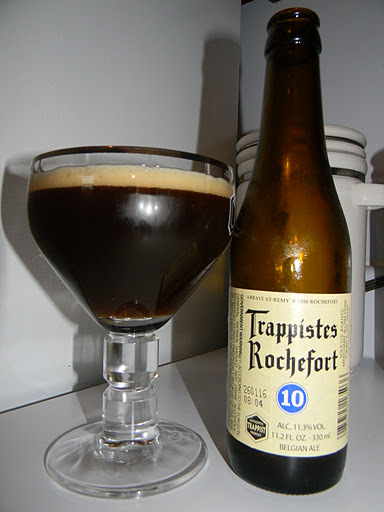 The Rochefort 10 poured a very hazy, murky, dark brown to burgundy color. An off white head was poured to a decent size, but it was very fizzy and “soda like”. The retention time was minimal and the lacing was not all that great, although it did leave behind some significant alcohol feet on the sides of the glass. The nose was outstanding!!! Deep, dark fruits of grape, figs, plums and prunes. It, literally, smelled like plum pudding. Very bready and very yeasty too. Hints of a baked, doughy pie crust along with spices of clove and a slight tone of apple butter. Maybe a little bit of rum in there too. The alcohol note was well balanced and never got in the way. This nose is extremely harmonious, robust and complex. Wow!!! The taste seemed to bring out a lot more spice than did the 6 or the 8. Very “clove like” with a heavy jolt of alcohol at first. Once it settled, the dark fruits started to explode. Tons of dates, prunes, raisins (grapes) and plums. You name it…. it’s in there. It was very sweet, although the richness was counterbalanced by copious amounts of breadiness and yeast . I even started to receive a slight bit of caramel sugar. The bitterness seemed subdued, but enough was there to give the tongue an slight tickle. This taste is “world class” in my opinion. Rich and bold. The mouthfeel was medium bodied with a great amount of carbonation. It was smooth, chewy and suitably dry. It completely inundated the palate with flavor. A welcomed warmth and only a very light, easy going burn was noticed from the alcohol. Very nice I must say. Man. This is a great little beer. Now, I love the 8, but the 10, for me, gets the slight nod as being better. The appearance may not have been the best that I’ve ever seen, however the aroma and the taste more than make up for any lack of the other characteristics. I can definitely see why so many people rave about this beer. It is superb. I would love to find a bottle of Westy 12 and compare the two. I’m sure you couldn’t go wrong with either one. This is a sipper, so the drinkability is not the greatest, but there is no need to rush through this thing. Let it sit and develop because it only gets better and more complex as you go along. If you have yet to try this brew. I would highly recommend it. I don’t think that you will be disappointed if you favor the Belgian style of beers. Be sure to let me know what you thought of it if you have sampled it. Thanks for reading and commenting folks. I appreciate all of the support. I would love to hear some feedback on what you think of the blog and if there is any area that you think I might be able to improve upon. I want it to be the best it can be. Hello again guys. Today I’m going to be trying a very special brew. The Trappistes Rochefort 8, which is brewed by Brasserie de Rochefort (Abbaye de Notre-Dame de Saint-Remy) located in Rochefort, Belgium. I tried the Trappistes Rochefort 6 a couple of months ago and found it to be quite tasty, however everyone I talked to suggested that I try the Trappistes Rochefort 8. Well, I picked up a bottle and today is the day to take it for a ride. The website, abbaye-rochefort.be, is written in French and Dutch, so I have no idea what it says. Let’s just go ahead, give it a pour and see what this beer is all about for ourselves shall we? This beer stands in at 9.2% ABV and comes in an 11.2 oz. bottle. The brew poured a very hazy, deep burgundy to brown color. An enormous tan head was formed from a very easy pour. It was both soapy and rocky with tons of “snack, crackle & pop.” The retention time was pretty good and the lacing was average. The cap settled to a fine film, however the foam was easily regenerated with a quick, aggressive swirl. The fragrance was a well balanced profile of dark fruits. Figs, dried raisins and plums. Faint alcohol notes were found and it also showed a wonderful nose of yeast, sour dough and fresh biscuits. The aroma was balanced very well. It’s not overly complicated nor did it present a ton of spice, however it was still a very pleasant and aromatic bouquet. The taste let more of the dark fruit shine. Again, raisins, figs, plums and maybe even some cherries. Doughy biscuits with a slight syrupy taste. Mild touches of sweet chocolate and licorice. The alcohol was tasted somewhat, but it remained “low-key” and never became distracting. The taste was way more complex than the smell, yet it remained super well balanced. This was a very tasty and outstanding flavor. The mouthfeel was medium, chewy, smooth and dry. A prevalent alcohol warmth hung on after the swallow, although the palate adjusted to it with ease. More than enough flavor was left behind after the sip. Very nice. Overall, I thought this was an outstanding beer. It had a very good aroma, outstanding flavor and a worthwhile mouthfeel. Not to mention that it’s relatively easy to drink considering the higher ABV. It was also a very enjoyable drink that complimented the late evening session perfectly. I would highly recommend you give it a try if you have not done so. I will be sure to seek this out in the future. I have a 10 set back that I can’t wait to crack open and compare to this one. Of the three Rocheforts, which do you guys prefer? The 6, 8 or 10? Thanks for reading and commenting folks. It’s greatly appreciated. Until next time. Today, for my craft beer review, I’m going to be sharing with you the Trappistes Rochefort 6 from the Brasserie de Rochefort (Abbaye de Notre-Dame de Saint-Remy) Brewery located in Rochefort, Belgium. I don’t know a thing about this beer or how well it’s perceived in the craft beer community, so I’m looking forward to going into this with no preconceived notions and determining for myself. I found a website, abbaye-rochefort.be, but it’s dedicated to the Abbaye and is only transcribed in French and Dutch. I could tell, however, that it did have a sub-link reserved for the brewery, so check it out if you can translate French or Dutch and let me know what it says. Haha. Heck with it!!! Let’s just find out for ourselves, shall we? This brew came in an 11.2 oz. bottle with an ABV of 7.5%. The beer poured a murky, burgundy/brown color with a tan head that was a soapy and creamy mix. It sounded like Rice Crispies with a “snap, crackle and pop” as the head dissipated. The crown revealed a good size, but only average retention. The lacing left behind was nice and the head settled to a fine film and then to a fine ring around the top. I saw a little bit of sediment floating around in the brew as I swirled. Overall, this beer doesn’t look too bad. The aroma was very nice in my opinion. Moderate hints of spice combined with a toasty, baked bread. Eloquent hints of dark, fruity figs and dried oats. It smelled of yeast and grain and very creamy. This thing was balanced very evenly and had just enough “oomph” to keep me entertained throughout the entire drink. With the taste I experienced quite a bit more of the spice, which began to lean more toward a cloves characteristic. It contained a very small hop bite with a minuscule sourness. A rich, dark fruit of fig created a light sweetness and more of the bready, yeasty hints rounded out this well balanced and harmonious taste. The mouthfeel started medium, yet as I sipped it started to become a little thin. It was smooth, dry and lightly chewy. It left an above average amount of flavor behind on the palate, but I did feel that the carbonation was lacking just a wee bit. I’ll tell ya, this was a pretty darn good beer. Very solid and well made. I absolutely loved the nose on this thing. The drinkability was good and I could definitely see myself settling down with this late at night while playing my guitar or reading a good book. I would recommend you give it a try if you happen to run across it. Sure, it’s not the greatest beer I’ve ever had, but I would be more than happy to have a few more bottles of this in my fridge. I understand that Rochefort makes not only the 6, but an 8 and a 10, so I’m going to have find those and compare them and see which I like best. Thanks for reading and commenting everyone. I hope you are enjoying the reviews.